Scientists at Tokyo Institute of Technology have developed a sensitive fluorescent antibody probe that specifically detects monomethylation of lysine 20 in histone H4 in living cells. This research has future implications and can be used to monitor the dynamics of histone modifications and genome integrity in single living cells without disturbing cellular functions. Genomic integrity in living cells is maintained by packaging of nuclear DNA into chromatin, which protects it from damage and controls gene replication and expression. Histones are the primary protein components of chromatin and their post-translational modifications regulate chromatin structure and play a fundamental role in biological processes such as DNA repair, DNA replication, mitosis, etc. Among the modifications, methylation of histone H4 at lysine 20 (H4K20) is evolutionarily conserved from yeast to humans and exists in three states, mono-, di- and trimethylation, each of which have distinct biological roles. Conventional techniques studying regulation by histone modifications are limited to fixed (dead) cells, thus preventing assessment of histone modification in single, living cells. To address this challenge, a group of scientists led by Prof. Kimura from the Institute of Innovative Research, Tokyo Institute of Technology, generated a genetically encoded live-cell imaging probe for sensitive monitoring of the intracellular spatiotemporal dynamics of H4K20 monomethylation (H4K20me1). The probe, called mintbody (modification-specific intracellular antibody), is a single-chain variable fragment tagged with a fluorescent protein that demonstrates high specificity for H4K20me1 over di- and trimethylation in living yeast, mammalian cells, and even multicellular organisms. H4K20me1 is most likely associated with the tight packing of a redundant (inactivated) female X chromosome (Xi) into heterochromatin. In a roundworm Caenorhabditis elegans model, Prof. Kimura and colleagues showed that the H4K20me1-mintbody could be used to monitor changes in H4K20me1 over the cell cycle and localization of dosage-compensated X chromosomes without disrupting cell function. Thus, the new mintbody can overcome the challenges associated with visualizing and tracking histone modifications directly in living cells. This research also identified key amino acids responsible for H4K20me1-mintbody conformational stability, solubility, and consequently, functional performance using X-ray crystallography and genetic analyses. Thus, a possible solution to the existing problem of limited solubility of intracellularly expressed antibody fragments due to aberrant folding in the cytoplasm that restricted their use was formulated. 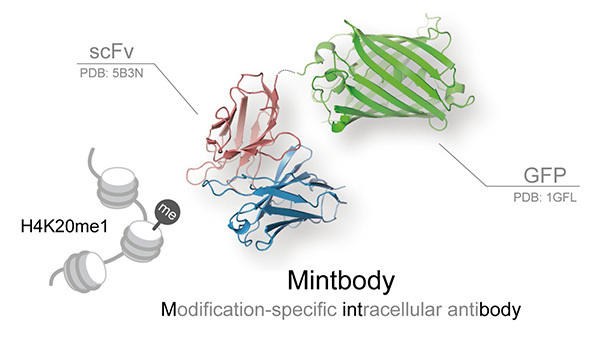 In the future, development of additional mintbodies specific to diverse post-translational histone modifications will facilitate the identification of regulatory mechanisms that control epigenetic modifications.